These cookies are so soft and fluffy thanks to the cornstarch and make perfect dessert to round out your meal. Since they are mostly carbohydrates, enjoy them with a meal that is high in protein a moderate in fat. Combine flour, cornstarch, baking powder, salt, cinnamon, and brown sugar in a large bowl. In a separate bowl whisk egg, vanilla extract, and applesauce until combined. Pour wet into dry and mix until well incorporated. Stir in mini chocolate chips if using. Dough will be sticky. Chill dough in refrigerator for 10-15 minutes. *(This step is essential in order to roll the dough into balls to dip in cinnamon-sugar coating). Meanwhile, combine white sugar and remaining cinnamon in a small bowl. 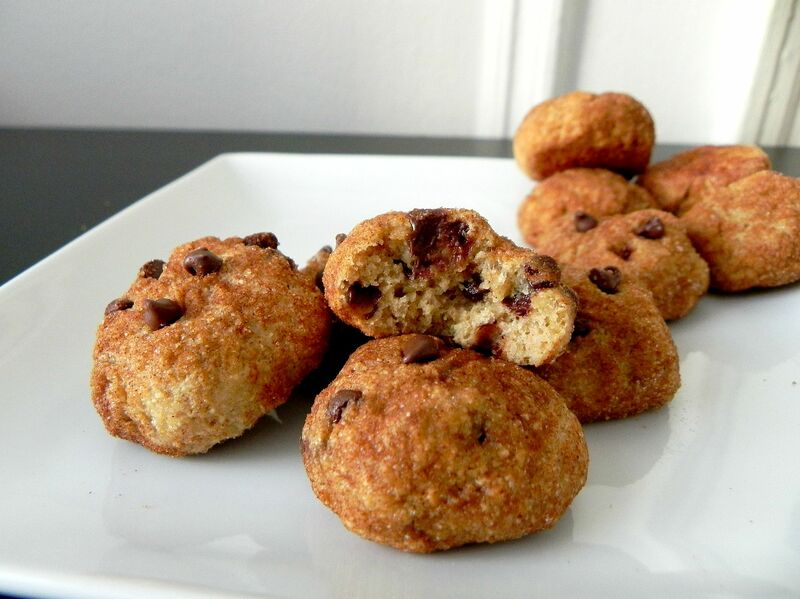 Using a small cookie scoop or spoon, scoop chilled dough, roll into balls and dip into cinnamon-sugar mixture individually. Place cookies on a silpat or greased cookie sheet and bake for 8 minutes. The cookies will look slightly underdone, but remove from oven and allow to cool on baking sheet for 3-5 minutes before moving to a wire rack.